Rate this Article Can't get enough from Taonga? Here are four other similar games that you can try. In Taonga, you get the chance to turn an abandoned island into a highly productive farm that produces more than enough for what you need for consumption. You can sell your produce as well in order to earn in-game cash. You might feel like you want more after finish the game, but Taonga’s all that you got. Don’t fret, because there are four other games that you might want to play and that shares your favorite game’s mechanics. They might not compare to Taonga in your eyes, but they come quite close. First on the line is Island Experiment. Its name alone should invoke memories of your favorite game. You’ll be glad to know that there are also unique challenges that make it stand on its own as well. The game puts you in control of a team of pioneers who set out to cultivate a wild and virgin island, and turn it into a new settlement. Instead of having a farm land that’s ready for you to cultivate, Island Experiment instead requires you to explore and then cultivate a wild piece of land into a farm. In addition to that, throughout the levels you will have to continually develop that settlement that you and your companions have set up in order to make it more productive and more suitable for modern living. Coral Isle sets you upon a similar environment, but under different circumstances. You control a group of plane crash survivors, who must survive in an alien island following an aircraft accident. With only a few of their belongings as tools and without any other means of communicating with the outside world, you must guide them to survival. 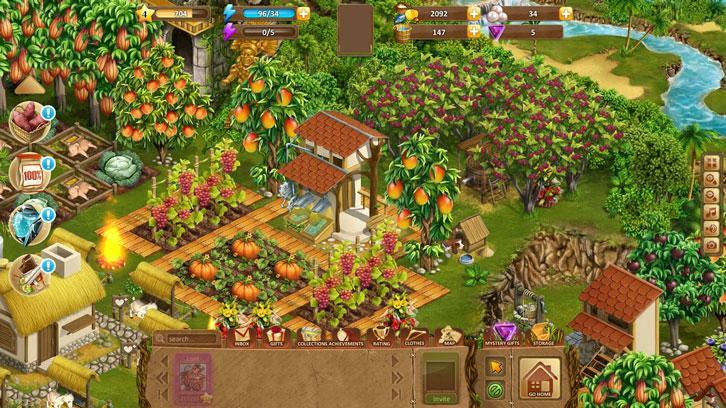 Farming is in the middle of the gameplay, but agriculture is never complete without livestock and some production facilities. However, before you can farm, you must send the survivors out to forage the deserted island for food sources and some raw materials. Foraging will continue to be a part of the gameplay, and a complement to when you ultimately establish a productive farm that’s able to produce food for your new community. The third game, The Tribez, takes the tycoon concept a bit further. In here, you command a tribe of primitive humans, set in a time where today’s creature comforts were virtually unknown. While the concept of farming and managing resources remain a central part of The Tribez, it has an additional feature - you must satisfy several leadership requirement or your tribe could become unhappy. Keeping your farm and tribe healthy and happy is a main requirement for moving forward in the game’s levels. The world is the limit when you play the fourth game, Happy Acres. Retaining all of the gameplay mechanics of a farm management game, this one gives you a whole world to expand in and enjoy. There’s virtually no limit as to how big you can make your farm - just keep on playing and expanding and you’ll be surprised at what you can do here. Most of all, it has the best graphics among all four of the games listed here, so you definitely won’t go wrong with this. So, if you are feeling separation anxiety from Taonga, and you don’t know where to go next, these four games should show you the way.